I bought this epattern by Jamie Christina at PHAT Fabrics. 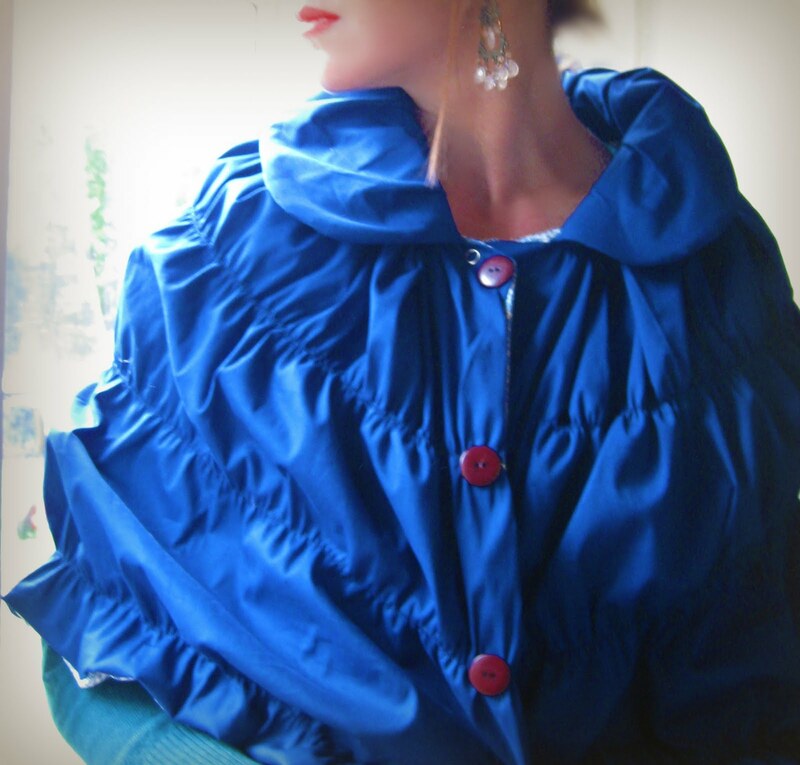 I made it with stretch cotton poplin in deep blue, with a tiny flowered fabric interior. It has hook and eye closure, the buttons are optional. What do you think? 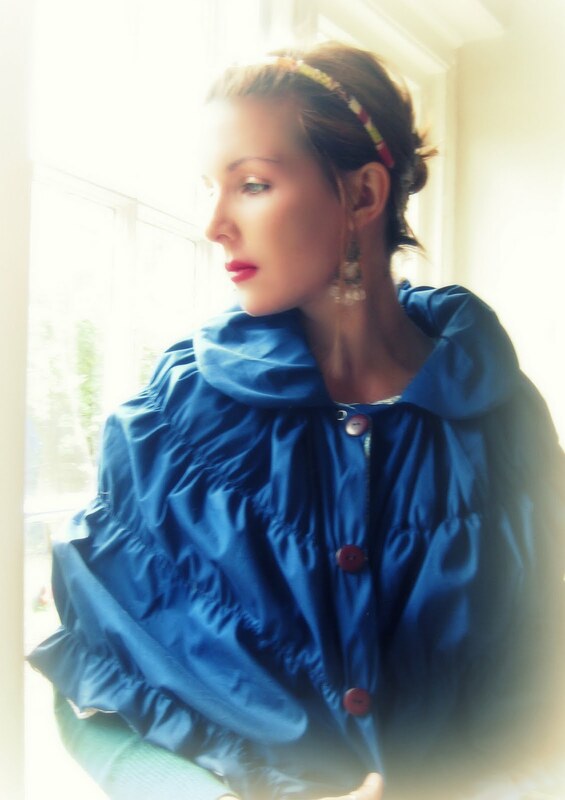 I planned on an outdoor photo shoot, but the English weather did not abide. My husband made me post this pic. I hate how I look without mascara, but he likes me better that way. Ugh. 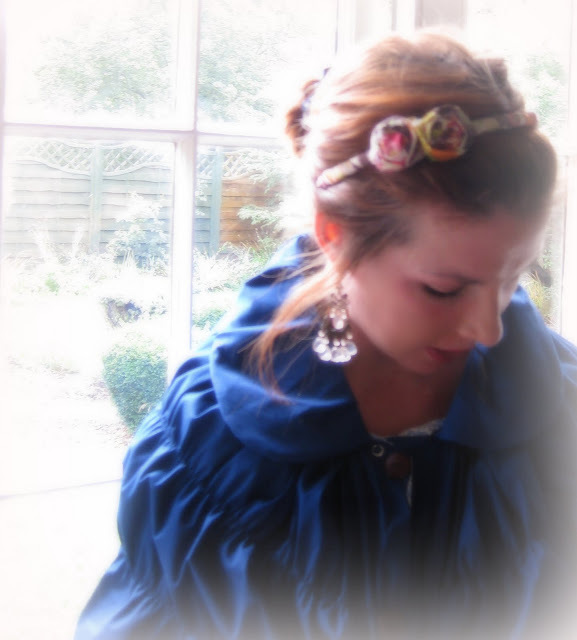 Do you like my Anthropology-inspired rosette headband? I was so proud of my stupid bag I made and but now I feel very amature! 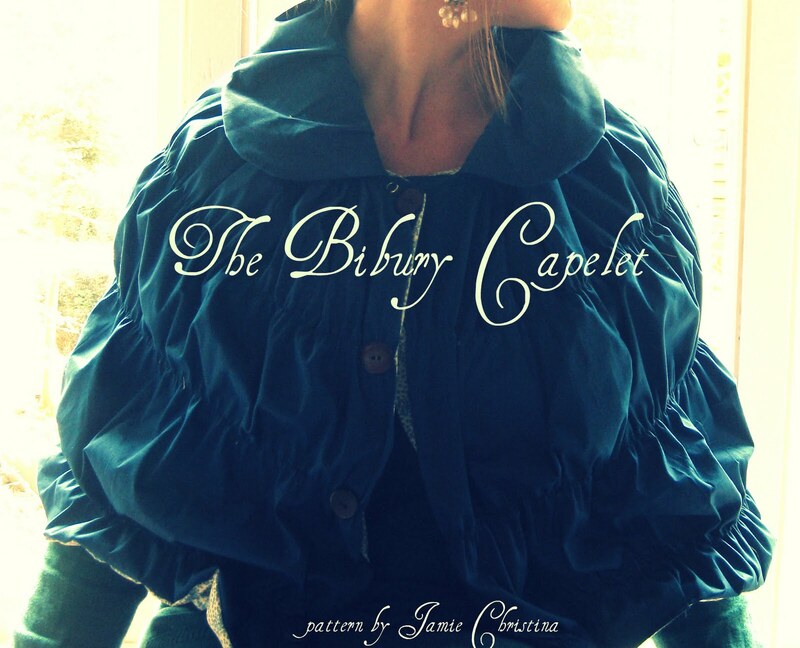 That capelet (new word for me) is so gorgeous! I am with your hubby... I love that pic of you! Very chic! Love your headbands. And you have a very fun blog!!! I'm following you now and I will add a link in my sidebar. I hope my followers pay you a visit. Oh and Happy Pink Saturday! Fantastic as USUAL!!! you are really quite the designer now eh?! LOVE IT! Hi Natalie! Thanks for your sweet comments on my blog! Freeport huh? Yes, small world. Not far from here at all. In fact, we'll be driving through Freeport next Saturday on our way to Galena for the weekend. Everything you made looks terrific. I got to your blog through Jamie's. Hope that was o.k. Ooh I'm enjoying looking at some of your old posts...I LOVE these shabbyish headbands...the COLOURS!! gorgeous pinks and yellows...it just MAKES them, doesn't it? Love the freyed edges etc...real nice. And that's a lovely shot of you..mascara or no! ;) (what is it with us girls??) be happy in the skin you're in...you are truly stunning!! !